I’ve been back in the studio but haven’t found anything to post to the blog. Seems like I’m always prefacing my blog entries with apologies for not posting. I’m going to stop doing that. Usually I yell hallelujah to have nice sunny weather but I’m getting ready for a little cooler weather and I need rain on my lawn………..SO today the cool front is due to arrive. We’re still in limbo on the farm/ranch but that will go on for some time. In the studio I’m preparing for a 40 x 70 diptych for a client in Austin, TX……..also another the same size that is not divided into two canvases. The first one will be along the lines of The Red Thread and the other similar to Collioure 3, except as a horizontal rectangle instead of a square. (image cropped and shown). I don’t have that great a memory for all the layers of all my paintings so I’ll just have to wing it and hope it works out. Sometimes later paintings are better and then there are the times that the first ones hold the “magic” that is gone when that one is finished. We’ll see. Someone mentioned a quote (I am so bad at remembering things verbatim)……..to the tone of “good enough is not good enough”. That’s my philosophy as well so I’ll be trying for excellence, not just good enough. Guess what, another red painting! Another red painting! I was working on this one before I left for colony and decided to not take it with me. All the family emergencies have kept me from getting back to it until last night. I think the colony visiting artist, Randall LaGro was right. Some paintings are finished when you come back to look at them again with new eyes. This one had a little tweaking to do but from a distance you wouldn’t know I did any more to it. I was rushing around today looking for a box to ship a painting to an Austin, TX gallery. They need to be able to show a client my actual work before commissioning a painting. Everyone seems to want “The Red Thread“….these people included, so I might be making a similar painting on down the line. The original just got to the Hilligoss Galleries in Chicago this afternoon. 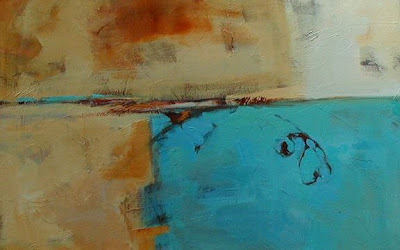 It will be included in the Women Artists Of The West show there, opening November 9 and 10. If anyone will be in the downtown Chicago area on those dates, come by and introduce yourself. I’ll be making my first trip to Chicago for this show. I’m tired and even more tired of trying to find a good ISP for out in the country. 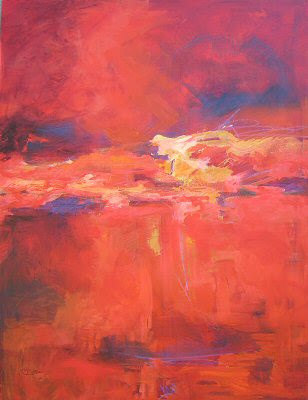 Wonder what this new red painting will be titled….it’s 48 x 36″.???? Suggestions welcome. Good things, bad things, weird things! GOOD…I got home from colony all fired up with probably 6 unfinished paintings in various stages of finish. I had lots to do and clear out so I could get back to it…..including finishing a 48 x 36 I had on the wall easel. Do I have it all done, or half??? NO NO NO. I’ve been flitting from one thing to another and not getting anything cleared. AND then the BAD/SAD, my mother in law died…only two weeks after her husband. Not easy to think and talk about. They both had a long life but we’re never really ready to say goodbye…and then we have to whether we’re ready or not. So in the midst of all this all the paintings are still lining the hall, all the paints are still in their wheeled boxes, the unfinished one on the wall is still not finished and even all the images from Colony haven’t been formatted or the web pages set up. On top of that…………the WEIRD is that just before all this I ordered a new cell phone. WELL, let me tell you, I change stuff like this infrequently and now I even have a different brand so there is a new tech learning curve. This new slider Sony Ericsson W 580i (white) can play music, help you work out and count your steps, take 2 M pictures and who knows what all that I have to figure out how to do. I finally figured out how to get all the stuff from one sim to the other , charge, and make calls at least. Some of the other goodies may have to wait for another day as I don’t know how to get music on it yet and heck it has hands-free and ear buds. Maybe this will keep my brain young. GOOD……….someone is really interested in Conversations, Blue Green but I was on my way to making “arrangements’. Maybe it will go through and maybe not.